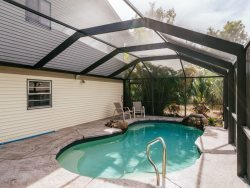 Located just steps from the pristine shoreline of Fort Myers Beach, Polynesian Vacation Villa #5 awaits your arrival! From the well-equipped kitchen to the high tide of upgrades, this lower-level studio has everything you need for a short stay or an extended getaway! Recently renovated, this slice of paradise accommodates up to 4 guests as it features a queen size bed and a queen size sleeper sofa. Want to take a break from the sun? You can do so on the outdoor covered deck area while enjoying the sounds of the waves gently dancing on the sugar white sand! Polynesian Vacation Villas has an onsite laundry facility and private beach parking is included! You will find that Polynesian Vacation Villa #5 is conveniently located! Just steps from your front door, you will enjoy plenty of soft sugar sand beach! Right across the street you will find a bar, restaurant, and massage parlor. With just a short stroll up the beach or quick trolley ride, you will be sure to enjoy popular Times Square district which is home to the famous pier, dining, shopping, and many island activities!